Dr. Christine Feleciano grew up in an animal loving home where the animals were family members. This early understanding of the human-animal bond combined with her natural love and respect for animals led her to her career in veterinary medicine. Christine approaches veterinary care with deep compassion, a gentle touch, and a dedication to providing the best care possible. 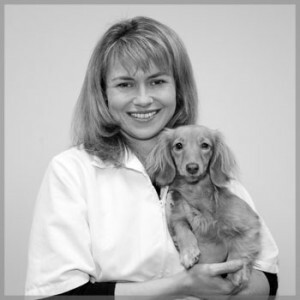 She focuses on the whole animal health for cats and dogs as well as small mammals, treating specific health concerns while addressing the overall health and well-being of the pet. Christine not only bonds with the animals in her care, but also forms lasting relationships with many of the people who entrust her care. Christine shares her home with her husband, a veterinary radiologist; two children, three cats and one dog. When Christine is not at the hospital, she enjoys many activities including scrapbooking, sailing, fitness and spending time with friends and family. She also pursues opportunities to educate the public on animal health issues and the significance of the human-animal bond.